Vegan Nosh celebrates peace and non-violence with delicious vegan food! You’ll find reviews about great new markets, restaurants/food carts or products. There is ranting about strange things like gelatin used to clarify beer or extracted fish oils added to commercial orange juice (eeew). It follows experiments with new foods, techniques for preparing & preserving, as well as looking at the array of seasonal produce and how to use it. Really, if it relates to food, any topic is fair game. There are also many recipes. Vegan Nosh was started by Sherri Koehler and she writes the majority of the content here. Some of her friends have also been invited to add posts as well, which contributes to the diversity of recipes and topics presented. Vegan food rocks, isn’t hard, and is the most compassionate choice a person can make for themselves, other sentient beings, and our planet. Remember: Eat Like You Give A Damn! 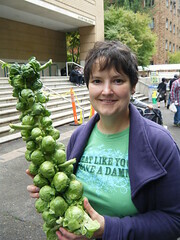 My t-shirt in this picture came from the fabulous Herbivore Clothing Company! They make awesome stuff and are wonderful people; go buy things from them! Zen Vegan – It helped me so much. Thank you. I too have been feeling this way in my community/12 step fellowship meetings for some time now. I have stopped going while I sort my feelings and have been doing an inventory/self searching. I just want to thank you and if I may share this on my fb page for others that may find comfort in your words. It helps to know we vegan are not alone! I’ve been vegan for 10 years now. I am growing relations with like minded people and losing contact in some relations with long time friends. It is a journey for us all. I commit myself, my time and energy – to be of service to the animals that have no choice- no voice. That is where I feel my work is to be done. And to live peacefully with awareness. To truly “LIVE AND LET LIVE”. I have been clean and sober for 21 years this month and I am forever grateful to my fellowship for setting me on this path of awareness and growth. As we say in the rooms- Thanks for letting me share! I hope we cross paths one day – I love Portland.